These are CRAZY realistic you guys. We’re talking juicy patties, soft buns, and homemade secret sauce. Vegan food is on the rise, my friends! And with it comes more options and more deliciousness. There is a major shift happening in the world and it is so exciting. 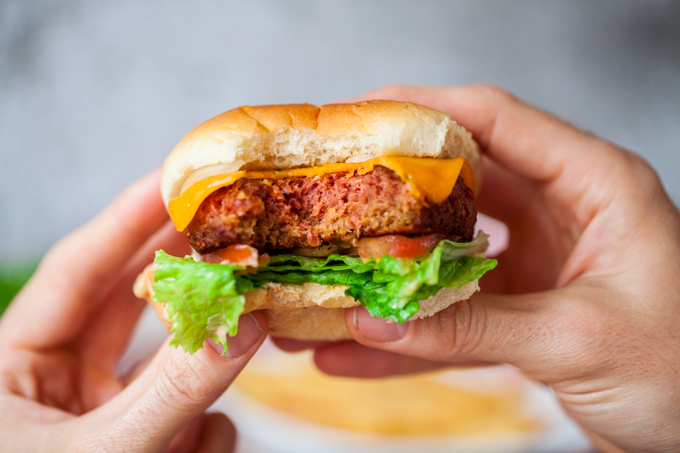 More and more companies are investing in delicious, sustainable alternatives to meat and dairy, like these Beyond Burgers! These hearty patties have such an authentic look to them and they are so tasty! They are a wonderful alternative to burgers made from cows. I hope that meat eaters across the globe will give them a try. I think most non-vegans simply don’t realize that many of the flavors and tastes they love can be replicated using entirely plant-based products. I am aiming to open their minds one recipe at a time! Like these Vegan-N-Out Burgers for example. People go craaaaaaaaazy for In-N-Out here in California. Nearly every time I drive past one, there is a huge drive through line circling the building. We were stalking the Whole Foods out here waiting for them to stock this product. They finally arrived in California and can be found in many grocery store chains. If you can’t find the Beyond Meat patties where you live yet, don’t fret! The company is expanding rapidly, I’m sure they will be taking over the global market soon. Not gonna lie though, it was nice to not make everything from scratch for this one! The meal was ready in a jiff and we used store bought frozen fries. Tastes like the real thing but better! If you try this Vegan In-N-Out Style Burger, let us know how yours turned out in the comments! We’d especially love to hear if you made it with any different vegan burger patties. We want to know what works! If you love massive vegan sandwiches, be sure to check out our Mac Daddy Vegan Breakfast Sandwich or our Vegan Tempeh BLT with Sriracha Tahini Sauce. AMAZING Vegan In-N-Out Style Burgers! Juicy, authentic patties with melty vegan cheese and homemade secret sauce. To prepare the secret sauce, whisk all ingredients together in a small bowl. Lightly toast the buns. Season the thawed patties with salt and pepper. Heat a skillet over medium high heat and melt the vegan butter in the pan. Cook the patties for 3 minutes on one side then flip. Layer the cheese on the patties and cover the pan so the cheese melts. Cook for 3 more minutes. To make the burgers Double Double style, divide each thawed patty into two parts. Form them into balls then smash them into ¼ inch thick patties. Cook each patty for 2 minutes on each side, melting the cheese on top after flipping. Build the burgers with two patties, and desired toppings. To make the burgers Animal style, spread a layer of yellow mustard on the patties before cooking them in the pan, then include sliced pickles and grilled onions when building the burgers. To save this Vegan-N-Out Burger recipe for later, simply pin the photo below! I have made these burgers a couple of times and they are soooo good! I’ll have to try your version. I’ve used grilled onion, vegan cheese, arugula and avocado on mine. OMG Megan! Your burger looks so amazing! I would love to try it. Unfortunately I can’t buy the products here. Beautiful pictures, they really make me hungry!!! Thank you Ela, you are so sweet! The company has been expanding distribution really quickly! Hopefully they make it to your end of the world soon! Omg! This looks freaking amazing! Sadly, where I live doesn’t carry the meatless products. I’m trying a spicy black bean patty instead! Hope they look just as wonderful! I liked the sauce, but the patties themselves made me uncomfortable. I’ve been meatfree for ten years, and they were just too similar to beef for my piece of mind. Left me feeling queasy. So uh, use a different patty? I feel the same way! Its so creepy! I will do this using the Sunshine Burger. The mushroom one is really clean and delicious! Thanks for the recipe!! Hi Shannon! Glad you like the recipe, I’m sure it will taste great with the Sunshine Burger. I haven’t tried that one. Is it a US brand? $15.00/lb for these parties no thank you please post how to make the patties instead I am sure they paid you for your advertising. Definitely not affordable and only 1/4lb, so, small. Beyond Meat did not compensate me for this post. I will always disclose if I am being paid to promote a product and I will only post products I personally enjoy and endorse. Most of the time if you contact a company, they will send you coupons to try their products. Just a suggestion, they are truly delicious and perfect as an occasional treat if they are normally above your food budget.